Martinique offers safe harbors and fascinating sea excursions. Martinique is a considered a paradise for sailors. Options include everything from Hobie Cats rented at beach shacks to luxury yachts fit for royalty. Bareboat and crewed charters of all descriptions are available at the marinas of Fort-de-France, Le Marin, Pointe du Bout, Le François, Le Robert and Sainte-Anne. Martinique's capital, Fort-de-France, one of the safest, most beautiful bays in the Caribbean, has long been a favored port of call with yachtsmen. 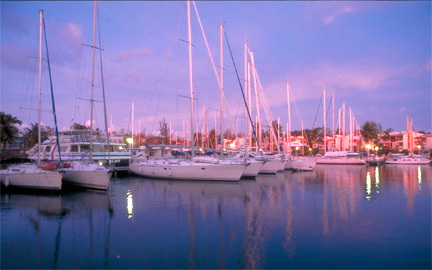 Over the years, as Martinique's popularity in the yachting world has grown, marinas have opened in other parts of the island: at Pointe-du-Bout across from the capital, in Le Robert and Le François on the Atlantic, in Sainte-Anne down south, and, most notably, in Le Marin, also in the south, whose "Port de Plaisance" is now the island's largest and best-equipped marina. A comprehensive bilingual yachting manual, the 140-page Guide Trois Rivières: A Cruising Guide to Martinique sells at local bookstores and ship chandleries, as does the annual Annuaire Nautique de la Martinique. Full-day outings around the island leave from Pointe-du-Bout daily, offering picnic excursions; half-day trips with snorkeling stops along the way are also available. Full-day trips and boat picnics also depart from Le François, and other outings are available from Diamant. There are also a number of interesting and varied excursions to Antigua, Dominica, Barbados, St. Lucia, St. Vincent and the Grenadines, Mustique and nearby islands are available through local tour operators. Please click here for a directory of boat rental and yacht charter companies.